Well, I don’t know about you, but I’m starting to get tired of this whole LG G Vista a little bit. Mainly because we already know about almost everything. On the weekend, we saw a webpage shot of the device and the launch date. Well, today, most of that information is confirmed (and contradict) by this leak that was reported by Droid Life. 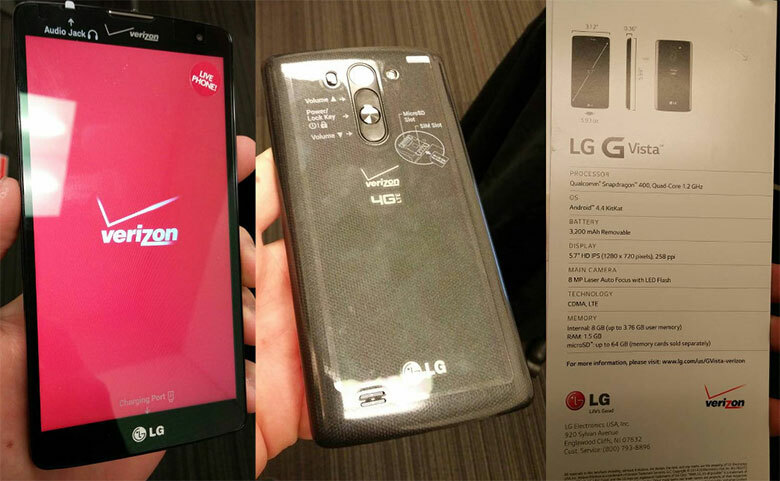 So, the leak was two pictures of the phone, front and back, and yes, it is a larger G3 by all means, with the huge Verizon 4G LTE on the back. There is also a picture of the spec sheet and the specs are similar to what we already know. The device uses a 5.7-inch 720p HD IPS panel to show its content, the leak on the week show a qHD (quarter HD) display. It runs on a Snapdragon 400 (I guess it is crystal clear, after we know that the handset has a 1.2GHz SoC), and an 8MP rear-camera with Auto Laser focus. The phone also sports 1.5GB of RAM and has 8GB of internal memory (the brochure specifically point out that user only have access to 3.76GB of the 8GB). It also confirms the 3,200 mAh battery that will be on the phone. This, however, did not make any reference to on-contract or full retail price.